The Orphanaid Programme was established in 1999 to mitigate against the impact of HIV/AIDS pandemic in Swaziland. The mission of the Programme is therefore, to assist Orphans and their families to live a normal and productive life. 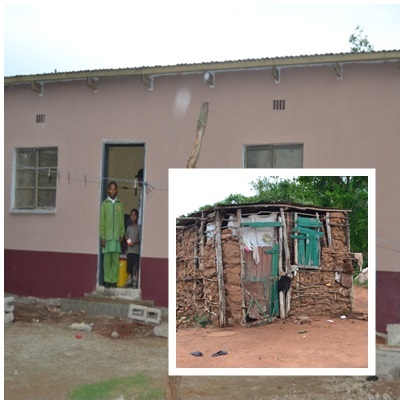 The Programme implements various projects to assist the families who have lost their economically active heads. The Programme gets funding support mainly from the Swaziland Government’s quarterly subvention, Diocese of Taichung, SACBC, CRS and Corporate business Swaziland Electricity Company (SEC). The orphanaid office in partnership with SACBC constructs two-room houses for orphaned and vulnerable children in the country. What is more significant about the latest constructed houses is that they were built by young men who were trained at MITC and funded by the project. The picture above shows a family situated at Lanjani in the Lubombo region. There are 6 family members, (2 boys, 2 girls and 2 female adults). The head of the household, Luvawule Shongwe lost her husband a long time ago. She also lost her only son who was the breadwinner in the family, and now she struggles to put food on the table because of old age. Her only daughter goes around doing laundry for neighbours in order to provide food for the family. Children very vulnerable, they do not even attend school due to lack of finances. During winter season, they suffer from the cold temperatures which sometimes drop to 5 degrees in morning, and during summer they cannot sleep at night especially when it raining because of the condition of their shelter. The Most Vulnerable Children project which was funded by SACBC was implemented in six communities (Tikhuba, Maphungwane, Langa, Matsetsa, Ndzangu and Malindza) in the Lubombo region with each site/community assisting 25 children. Overall, the total number of children assisted was 150 and they were receiving nutritional supplements, health supplements i.e. soap, towels etc (including health checks), warm clothing (including blankets) and vegetable seedlings. However, funding for this incredible project came to an end in September 2014.